1 - I am crazy OCD. Pretty much everything has a "system" and hell hath no fury like a woman's system disrupted. 2 - I have one brother called Andrew. He's 17 and just passed his driving test. Woo go him! 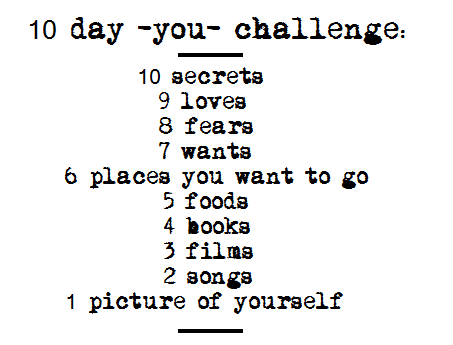 3 - I am scared of the dark. 4 - I have a giant mouth. Like you could park a car in this thing. My less lady like party tricks include me putting digestive biscuits into it flat / around a can. 5 - I drive a wee blue polo. I don't believe in naming things like that unless they're "real" like teddies. So it's just my wee car, and gets referred to as he and she. 6 - On the topic of teddies, when I was growing up I had a teddy elephant called Nelly. Obv. 7 - I grew up with a menagerie of pets- horses, dogs, cats, guinea pigs, chickens, rabbits. So many more. 8 - My current obsession is Tescos Sparkling Water, Pear and Elderflower flavour. 9 - I have surprisingly small feet - only size 6s. People are always like YOU'RE SO TALL, HOW DO YOU EVEN BALANCE? 10 - My Amazon wishlist is humungus. I went through 1001 novels you should read before you die and read reviews on then all and added the ones I wanted to read.